With 2016 coming to a close, I couldn't be happier. I would be lying if I said 2016 was the best year. It was probably my toughest and most emotional year yet. I'm not ready to go into detail of what has been going on this past year just quite yet, but one day I will open up about this crazy journey thats been unfolding and still going on. With 2016 ending, I have realized how strong I am, how strong my husband Gregg is and how much love and support we have from family and friends. 2016 was a tough year, but it still had many great memories too. Looking back, 2016 has made me so grateful for the things I do have. We got to travel a lot this year (well a lot for us at least!) Gregg and I got to travel to Hawaii over Valentines Day, which was the most amazing vacation - just the two of us. Then in July, we went to Carmel with the whole Harmeyer Clan and stayed in the most amazing beach house. In August, Gregg surprised me for our 4 year anniversary and took me to Solvang. We stayed in the most amazing tower suite at the Landsby and wine tasted for the first time- which was so fun! We had countless weekend getaways to the desert, which I am so grateful for. We are so fortunate to have a place we can escape to whenever we want to. In December, we had a fun getaway with some friends in Big Bear- where Sampson played in the snow and the boys went snowboarding. We had so many amazing adventures with family and friends! Now its 12/31/16 and we are currently in the desert with Gregg's parents, my sister and her boyfriend. I could not be more excited to have my sister here ringing in the new year. I wish my sister in law and her bf could be here too, but they had other last minute plans. 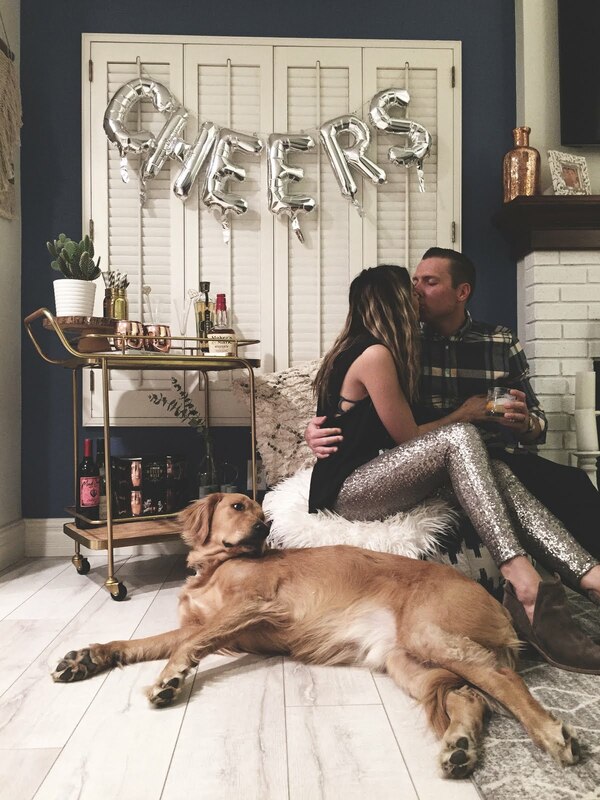 Our plan is to cook a yummy dinner and then go across the street to a festive NYE gathering with some champagne bars, live music and dancing! Hopefully we can make it until midnight haha! New year, new feels, new chances, same dreams, fresh start. I'm making a few new year resolutions this year but my number one is to be more present, live in the moment, and stop comparing my life to others. Social media really portrays peoples lives how they want people to see them - i'm just as guilty at this. With having a blog I struggle with the things I want to share and not share. I try and keep it pretty basic with outfit posts, pics of me and my husband and of course Sampson. For now, I'm ok with just sharing that. This doesn't mean I'm not human and I don't have struggles- because I do. I just choose not to share that much (for right now) Thank you for those that follow along my blog, I really appreciate your love, support and comments. You guys are super rad and beautiful people. I never get mean or rude comments which is awesome! I hope you all have an amazing 2017.